Learning Love from a Tiger explores the vibrancy and variety of humans’ sacred encounters with the natural world, gathering a range of stories culled from Christian, Muslim, Hindu, Mayan, Himalayan, Buddhist, and Chinese shamanic traditions. 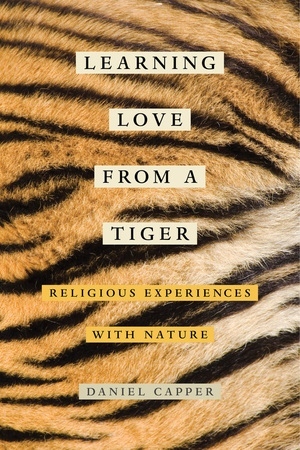 Readers will delight in tales of house cats who teach monks how to meditate, shamans who shape-shift into jaguars, crickets who perform Catholic mass, rivers that grant salvation, and many others. In addition to being a collection of wonderful stories, this book introduces important concepts and approaches that underlie much recent work in environmental ethics, religion, and ecology. Daniel Capper’s light touch prompts readers to engage their own views of humanity’s place in the natural world and question longstanding assumptions of human superiority. Daniel Capper is Associate Professor of Philosophy and Religion at the University of Southern Mississippi and the author of Guru Devotion and the American Buddhist Experience.